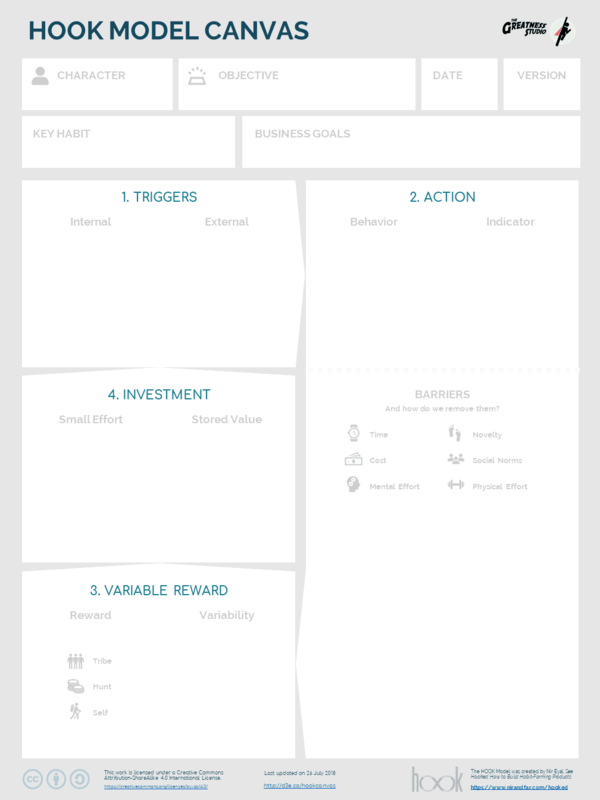 The HOOK Model Canvas is a collaborative ideation tool for designing sustainable habits, based on Nir Eyal's HOOK model. This closing keynote at the ProfsoUX conference in St. Petersburg explains how I use the HOOK Model Canvas. We often don't achieve our long-term goals, because we lack the necessary habits. Sustainable, meaningful habits empower people by helping them accomplish things like learning a new language, losing weight, or following a medical treatment plan. Empower people; don't exploit them. Sustainable habits are helpful, not harmful. Do not use the HOOK Model Canvas to exploit people, addict people, or make people unfairly dependent on your product or service. Use the HOOK Model Canvas to engage people in fair, equitable exchanges of value, where you empower them in meaningful ways, & they reward you for it.